Hallie Ephron: Today I'm taking you on a summer trip to a little island in Casco Bay, just a 10-minute ride by car ferry from Portland, Maine. 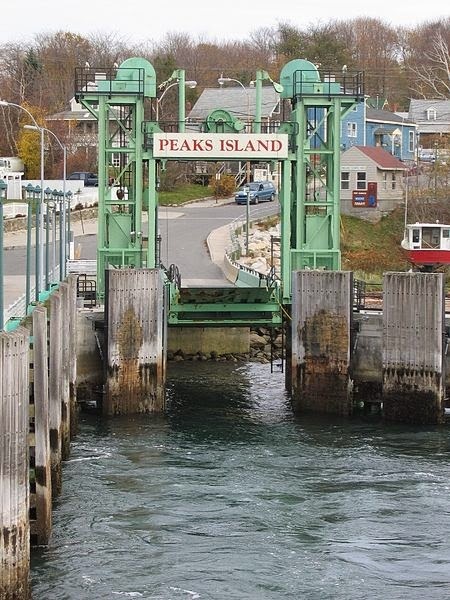 Most people haven't heard of Peaks Island, which it turns out isn't a bad thing since it's small -- a mile and a half long, about a mile and a quarter wide. Year-round population in 1896 was 343. Today about 860 people live there year round; with summer visitors the population swells to between 2,000 and 4,000. Most roads are not paved and there aren't many vehicles. We park our car in Portland and walk to the brand new ferry terminal. It's teeming with people on Thursday afternoon, waiting for the 5:30 ferry. But it's off-peak for cars -- only a few get on making the view from the car deck as we cross the bay nothing short of spectacular. Our itinerary always includes: A walk to the cemetery. It's got a fantastic view of incoming ferries, old gravestones with stories to tell, and trees that are teeming with cedar waxwings. Take any street and you'll find Victorian cottages, the earliest homes on the island, and quirky vacation homes. This one makes a statement with an enormous guitar covering the front porch. The main street features the world's only umbrella cover museum, along with a couple of restaurants, an inn, an ice cream store, and a terrific coffee and breakfast sandwich place. Walk a bit further and you'll reach the public library and the laundromat. And honestly, that's about it. But the beach, hidden away, is the big attraction. Here's me on Sandy Beach where the sand is fine and the water freezing. Just a short walk up along the back shore is the aptly named Stone Beach where visitors spend hours creating stone towers. 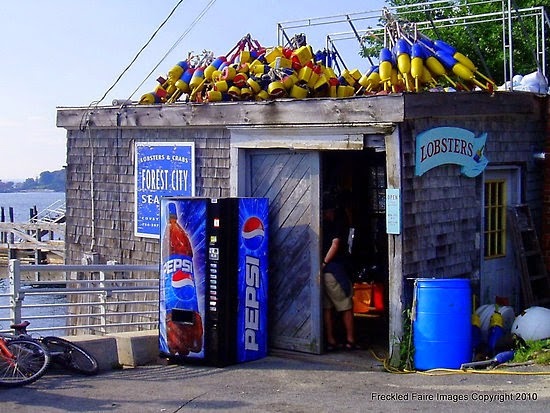 Dinner requires a walk back to the ferry dock to the Peaks Island Lobster Shack, hours of operation daily from 5 to 6 PM. Period. They haul the lobsters up from the ocean twenty feet below the floor of the shack. Cash only. And talk about fresh! Soft shelled lobsters, 5.99 a pound. Hard shelled lobsters, 7.99 a pound. We buy pound-and-a-half hard-shelled lobsters, take them back to the house, cook them with corn we've brought with us, and pig out. Okay, I've shared mine... What's your favorite place for a quiet summer getaway? Wow, what a spectacular place! Vacation heaven. Generally we do not have vacation getaway time, but this year we are talking about heading down to Norfolk to spend some time with our youngest daughter. Getting away around here means getting to see family. I think I need a trip to Peak's. Two friends used to go every year in early September. I love a walk on the beach at the end of the day, then reading and a picnic as the sun goes down. Which doesn't get me away too far (a fifteen-minute drive), but I love it. Before my brother inherited (because he promised my dad he'd keep it for the family) and barred us from it, we had a family lake property with four houses on it. My grandmother's house was the enclosed second floor of the boathouse, where you could hear the water lapping all night, and where I wrote several books because it was like being in a treehouse by the water. Oh noooo, Ellen, that calls for a murder mystery! Joan - extended family time is precious. YES, Edith - it's your kind of getaway! Ellen - what Lucy said, minus the "mystery"
Some of us in my family rent a house for the week at Chincoteague VA. We prefer a house in town. Part of the family spends most of the day at the beach at Assateague Island, some of us divide our time between the beach and the town. (The town is a great place to walk, and I personally love to go up and down the residential streets to see the gardens at various homes.) When I stay in town, if I'm not walking, then I'm reading. I take a few books along with me and generally buy at least two more while I'm away. When I'm at the beach, I read or take a long walk along either the beach or on one of the trails. I also go to the Visitor Centers and see if there are any free programs going on. I also check out the gift shops for nature books. Last year I discovered a book with photographs by the husband of back blogger Karen in Ohio. I knew he was a nature photographer, but oh, how lovely those photos were! If it hadn't been so heavy, I would have bought it but I had to take the train home for the last leg of my return trip, and I can't carry too many items! Oh, my - this looks like my kind of place, lovely and quirky and just delightful! If I'm near the ocean I'm at peace. I do not know Prout's Neck though it looks like it's just 40 minutes south of Portland. We've been to Biddeford Pool to bird... another relatively short hop south along the coast. Beautiful pictures. An umbrella cover museum? What's that about? Sad to say, my idea of the perfect getaway location is my front porch. No driving. I get to sleep in my own bed. Maybe while the kids are in school so the day is quiet. Why? Because when we go anywhere, my husband (who is constitutionally incapable of sitting still) tries to cram a zillion activities into every day. It can be fun - but mostly it is exhausting. I need a vacation where I can just sit (and my porch has a view of the beautiful golf course across the street). I've always wanted to spend time on Peak's. We're farther up the coast in Boothbay Harbor. Can't complain, that's for sure. Sounds like a wonderful place to unwind for a couple of days (except for the freezing water). I sure could use it. Thanks for the virtual vacation. Mary Sutton: Sounds like you need a vacation from your vacation. Even your husband would be hard pressed to come up with a packed itinerary on Peaks. I will be on Peaks Island Monday for two nights with college friends. One of my friends grew up in Worcester but spent summers on Peaks, and I first went there in 1965. I learned later that my grandparents (from Brooklyn) had honeymooned there. I have swum in the cold water and have walked around the island. My friends and I enjoy cooking, and watching the water from her porch. As a child, I went to Bloomingburg, NY (Sullivan County) where my grandparents had a big old house. I loved it! These days I am a year round Cape Codder -- so I am mostly a hostess. Yesterday was cloudy, so a friend and I drove to a different town for a movie. I don't have a favorite place, but I do love living in Los Angeles for the reason that there are tons of great getaways all up and down the coast. Much different than living in Texas! Hallie, I often feel that way post-vacation. In summer, we like Bald Head Island, North Carolina. In winter, you can't beat Siesta Key, Florida. But most summer mornings I am on my shady deck in Dayton, Ohio, surrounded by huge pots of flowers, humming birds and song birds, my sweet little Yorkie, Lottie Ann, at my feet, and am writing on my laptop. Now that is bliss for me! Hallie, your summer tripping sounds like the perfect getaway. I love visiting places where I can park the car and walk to everything, places where the world slows down a bit. I love sightseeing and all that, but I think one needs the quieter vacation, too, where being an observer is quite nice. Kathy Reel I love Key West too, and it is a different-things-for-different-people kind of place. Honky tonk... yes. Artsy... yes. Literary... yes. Great food... yes. And it's big enough to absorb all manner of loud leaving plenty of quiet places for the rest of us to enjoy. We have friends with a family home on Chebeague Island, off Portland. The house sits on a bluff looking out at the ocean and some other islands. It is divine! Then we head to Minot to see our niece, her husband, and their farm (goats, sheep, horses, dogs, a cat, and an African Grey parrot). The we head north to Ellsworth where we have a house and enjoy all that Downeast has to offer, including our various friends in Bar Harbor. Came back to read about everyone's favorite place and it dawns on me how unappreciative I might sound of our home when I mention how much I love the beach. Here I am sitting on our back deck overlooking a pond, listening to the creek running back in our woods and looking out over the mountains. No real close neighbors, so it's as quiet as any remote spot could be, and I can hear the birds chattering and singing to one another. And because there's no light pollution, we see more stars than a lot of people even realize the sky is capable of holding. Shame on me for forgetting for one second how lovely it is in these mountains. That sounds lovely, Hallie. I love that the lobster shack is only open from 5 to 6. I love holing up anywhere along the Oregon coast. So many nooks and crannies to explore. Kaye, I'm coming to your house for vacation. I have ALWAYS wanted to see a cedar waxwing in real life. SO wonderful..love these photos!